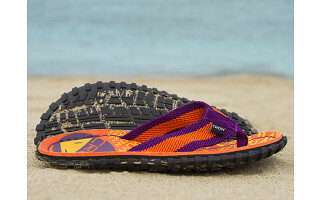 Vibrant pops of color aren’t the only thing that set Crow’s Feet apart from other flip flops you see walking down the street. What makes these open-toe shoes stand out is their quality construction and superior materials. Company founder and avid hiker, John Davis was on the search for a sport sandal that was comfortable, yet hardy enough for his active lifestyle. What he found was a sea of flimsy flip flops that weren’t built to withstand everyday wear and tear. 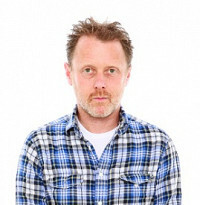 The idea for Crow’s Feet was born and John ran with it. Sporty, yet stylish. Sturdy, yet lightweight. Crow’s Feet give you plenty to flip for. The contoured footbed cradles feet in comfort. The curved edges promote a natural rocking motion as you walk making each step easier on your toes and feet than traditional flip flops. The tire tread outsole is every bit as rugged and durable as it looks. Definitely a step up from comparably-priced foam alternatives. Give Crow’s Feet a try and your feet are sure to thank you for it. Crow has always prided itself in creating unique, functional accessories - and our Crow's Feet are no exception. Extremely comfortable, easy to wear straight out of the box, these flip flops are sure to become your favorites very quickly. With fun designs and materials including genuine suede, our Crow's feet are easy on your eyes but better on your feet! Have questions for us? Fire away! IF anyone has a question or two I'd be happy to answer them! @eleanor Hi Eleanor - great question! The foot support is provided by our molded sole. It is NOT an orthotic and if you have been recommended to wear them, I'd stick with that.... we'd rather see you with good feet than unworn Crow's Feet!! @Desmond At the higher end of the mens they are a little smaller. So if you are 11/12 I'd recommend the 12. Do you offer anything in smaller sizes for kids? My kids love flip flops but they never last the season. It would be great to have something for them too. @Hallie Hi Hallie - yes we do!!! Our kids range will be unveiled next week on our own website albeit they may well end up here on www.thegrommet.com as inventory allows. The kids mix 'n match allow you to buy left and right feet separately - so you and you kids can choose from 3 lefts or 3 rights... thanks! Well, darn! I (an adult) want to be able to mix-and-match also! LOL! Any chance of that happening? I wear flip-flops year-round (yes, even in the snow). @E. You can always buy two styles! @John what is your own website? About sizing -- would the women's style tend to run more narrow or wide? I have a med-wide foot with high instep, so am concerned about the shoe bed, and the straps being too tight. But I would sure like to give them a try. How do they compare to, say Birkenstocks, which fit me well. @Anne Birkenstocks are excellent shoes. Our Crow's Feet are designed to have a wide non-restricting strap that conforms to your foot as you compress the sole. I would recommend trying them for sure - I've seen perhaps 250 people try them on and all I see are big smiles with the first few steps - and some of those folks wore Birkenstocks! I love the look and the functionality of these flip-flops. However, I have a lot of difficulty purchasing products developed in America, but manufactured in China. For now, I feel I need to pass. @Donna, Chinese people need jobs too, and not every Chinese employer is abusive. Hey John---these look great, but I am a rather large gentleman with a rather large foot size. Any chance bigger sizes will be made in the near future? I wear Size 15's. @Adele Adele they weigh less than 8 oz each, surprisingly light for such a sturdy, all round shoe. LOTS of questions ... no answers! @Bill Sorry ... I couldn't see the answers until I logged in ... now I see them all. So another question ... I typically wear wide sizes ... do these run narrow or wide? It doesn't say anything about what the top of the shoe is like. Is it soft or hard? Some flip flops feel as though you are standing on brick. @Bill Bill they are a very dense material so it is NOT like a brick nor is it like a sports mat with no support. I wear a size 8 1/2 women's shoe - should I go up or down? Are they made for exercise walking on a treadmill? @Guest They're not technically made for any one particular pastime however the nature of the shape with a cupping at both ends prevents slipping out of them far better than traditionally shaped, flat foot sole flip flops. Do you have children's sizes? @stacee You're not the first to ask - and yes we will have kids mix 'n match styles launching next week on our own site, albeit I believe The Grommet will absolutely be offering them in the future! I see on the order page that the brown color has a different material than the black ... can you elaborate? The Brown is Suede and the Black is fabric. Does this help? Any chance of a "slide" style? The traditonal between the toes is irritating to me. Definitely something we'll consider. I must say, though, that the ribbon between the toes on Crow's Feet is quite soft and non irritating, unlike most hard plastic types. Might be worth giving them a try? Would love to order the item but you do not have the color I wish in my size. Are you going to restock? Yes, we are thrilled that the sale has been so successful - but we've sold out of some styles/sizes. Check in early next week to see our inventory adjustments and hopefully we'll add just what you need. Women's size 9 only comes in red and tan color and there is no picture of that color combo. Can you tell me what it looks like? @Jana I have the same question--am ready to order but am not clear what "red and tan" means. Jana and Elise, The "red and tan" is the style with the cross and the words "Faith and Hope." As I was entering my selection and setting up my account my choice of women's 9 in orange and purple sold out. I could not add it to the wish list. Any chance of purchasing the sandal in my choice of size and color? We do hope to have additional inventory to offer next week. Stay tuned for updated quantities. And, sorry for the inconvenience. @John I see that you are out of stock already. Any idea of when I can expect to be able to order these? Hi Bonnie, scan just above as others have had same question. Hopefully back in stock very soon. Any chance the additional stock will be available this week? Specifically, women's size 9 in orange/purple? Lookin' good! And well priced. Do the soles happen to be made from recycled tires? @Alexandra Hi Alexandra, they are not recycled tires, but a blend of high grip polymers (plastics)! Hey John, I seem to have the opposite problem from most here. I have a narrow/lean foot but I tend to run a size 9 with most shoes. The problem I have with most flip flops is they don't fit snug enough and they are too floppy and I have to end up curling my toes trying to keep them on even in casual walking... Is there going to be a chance that you will run a narrow class of sizes for the longer footed class size 8-10 that has the cross strap that has been taken up so they fit snuggly for us? Just received the email about your great new flip flops this morning. However the only sizes available for Women are very small (6) or very big (10). Did I miss the boat? I'm a size 8 and would love to order a pair. @Shannon Shannon, we have had such an extraordinarily exciting response that we are indeed out of many sizes TODAY... however by tonight I will be able to update you on what additional items we will be able to add to the 'hopper'! And thank you for letting us know - we'll do our best to get you what you need. Thanks! I'll check back tomorrow morning for availability. Could I get your website address? Hi John, please email us at [email protected] and we can put you in touch with them. The launch day conversation has ended. Please direct further questions about this Grommet to our Community Experience Team. 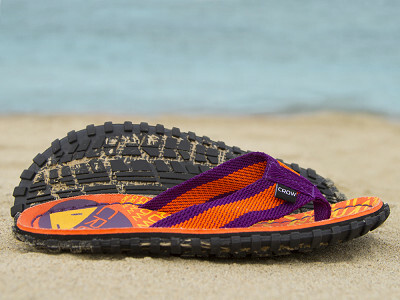 Vibrant pops of color aren’t the only thing that set Crow’s Feet apart from other flip flops you see walking down the street. What makes these open-toe shoes stand out is their quality construction and superior materials. Company founder and avid hiker, John Davis was on the search for a sport sandal that was comfortable, yet hardy enough for his active lifestyle. What he found was a sea of flimsy flip flops that weren’t built to withstand everyday wear and tear. The idea for Crow’s Feet was born and John ran with it. Sign up to see our latest discoveries and receive special offers from The Grommet. Copyright © 2012 - 2019. All rights reserved. | For U.S. Residents Only.